At 12,000 feet, near Mt. Lyell, Donahue Pass is the gateway to Tuolumne Meadows via the John Muir Trail. Camped with some friends just below the pass, at a small lake, this incredible sunset exploded upon us. 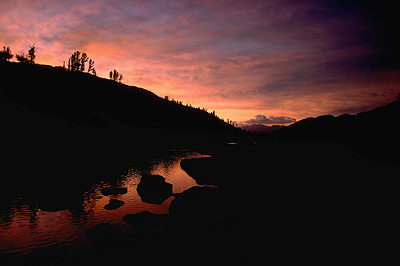 It is the most intensely beautiful sunset I ever encountered in the Sierra. I put the camera on a rock (since I never carry a tripod) and shot this photo at probably 1/4 second.